This year Easytherm, the product designed by MM Design for Piovan Group company Aquatech, was chosen from a field of 6,400 entries from over 50 countries, as winner of the coveted IF Industrie Form award. In the world of industrial technical equipment, function is often considered the top priority, with design largely overlooked. Mould temperature control is a crucial parameter in the processing of plastic materials; it must be constant, rigorous and precise as it directly influences production costs and the quality of the final product. Now, the fresh approach, oriented towards constant innovation, adopted by the Piovan Group’s Research and Development team, in association with the experience of MM Design, has led to Easytherm, the new mould temperature control unit, to be sold under the Aquatech brand name. Piovan takes great care over all its products, even if they are intended for the industrial moulding world, always seeking materials and solutions that combine performance with a distinctive brand identity. The temperature control unit is usually installed on the moulding machine to control the temperature cycle during the moulding process. The challenge was to come up with a functional, practical product tailored to users' needs. While keeping its function clearly in mind, when designing this product MM Design also focused on other factors, such as ensuring that the control panel would be perfectly legible by mounting it with a tilt, ideal for reading key data the operator needs to monitor at all times. The entire control unit is protected by tempered glass, and features 6 capacitative touch keys for immediate access to Easytherm's main functions. The submenus are browsed using a convenient infinite turn knob. Another important factor, often forgotten, is the capability of moving the unit from a moulding machine to another. Naturally, wheels are provided for this, and the inclusion of a handle greatly simplifies handling of the unit. When not in use, the handle retracts into the body of the device. Everything is integrated, including a flap underneath the display for access to the communication ports for Industry 4.0 digital connection. The operating control is clearly visible and integrated in the front. Creating optimal styling for the chassis, MM Design has come up with two steel shells which protect the temperature control unit from impacts and accidental knocks at the sides and also help to disperse the heat accumulated on the internal components. At the front, sheet metal covers and a polycarbonate display mounting panel combine ruggedness with visibility. The steel handle provides an excellent grip and easy manoeuvring during transfers. “A prize that rewards the hard work during the design phase, since from the outset we concentrated on man-machine interaction, with correct positioning of a clear, legible display and with a handle for easy mobility. Every detail has been carefully styled, defining a new design language for the brand," comments Alex Terzariol, owner of MM Design. A new internal and external layout, a redesigned, ergonomic control unit, and high-level components, are all combined in a versatile machine that guarantees reliability, precision and intelligent management of consumables. Easytherm operates with temperatures up to 90°C but the range will soon be expanded up to 180°C. A temperature control unit must provide trouble-free operation in any production environment. Therefore, to meet the varying mould temperature monitoring and control requirements during plastic transformation processes, Piovan Group member Aquatech has created Easytherm, a modern, user-friendly device with high chemical resistance even to aggressive fluids, electronic circuit boards well protected from vapours, humidity and extreme temperatures, and removable panels for quick, trouble-free maintenance. Easytherm's innovative character is completed by "Industry 4.0" compatibility, adding connectivity and convenience to ease of use. 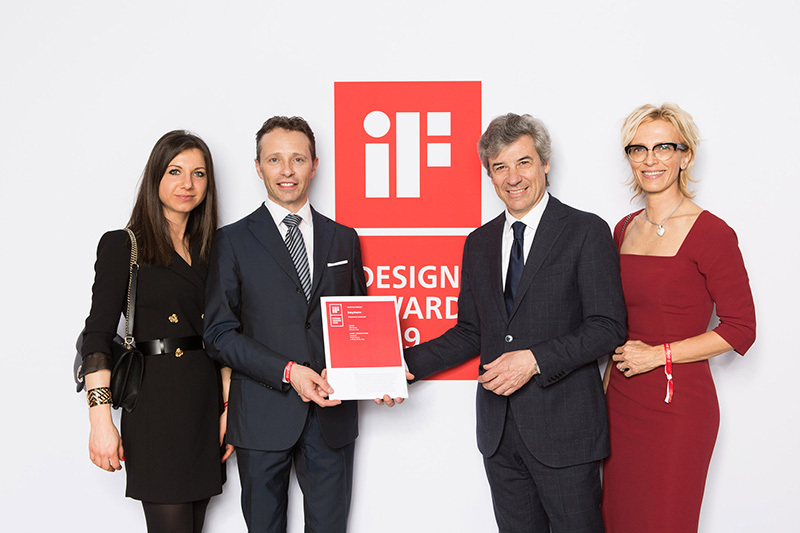 “We are proud of this award, achieved through our determination to be constantly innovative, even in choice of materials and in the design of our solutions. Easytherm derives from in-depth analysis of the market's needs, with the aim of producing a product that would successfully combine outstanding performance with quality of materials and modern design," commented Peter Dal Bo, Piovan's Group Chief Commercial Officer.